PLEASE first adjust the camera to the SAME mode with your system by OSD button, or else no pictures will be showed or image quality may be not good. All setting has been set by factory already, please don’t set again. If any wrong operation, please default to factory setting. * This is a 4-In-1 camera which compatibles with AHD,TVI,CVI and Analog DVR. Switch mode according to your DVR mode by OSD menu. * 2.8-12mm Varifocal Lens allows you to adjust for 36-95°wide angle or close-up views manually. * 2.0 Megapixel full high definition resolution 1080P(1920*1080) gives real and crisp image. * Built in IR-Cut filter. 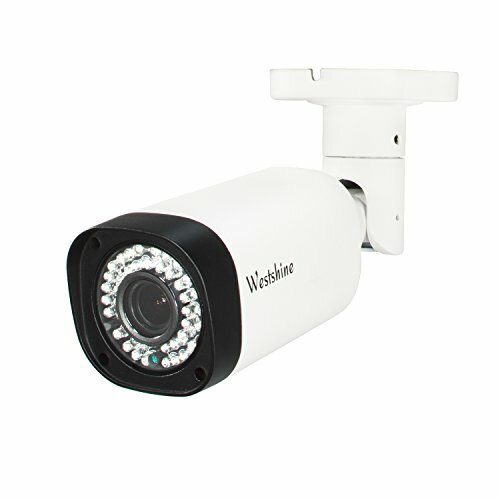 42pcs high-intensity infrared LEDs, allows up to 40m/130feet IR Night Vision Distance. * 3-Axis mounting bracket, metal housing waterproof protection, cable through bracket. 1 year warranty and lifetime tech support. Perfect for home/business surveillance.